It is much loved water park for the locals of Cairns and tourists who come to visit the city. 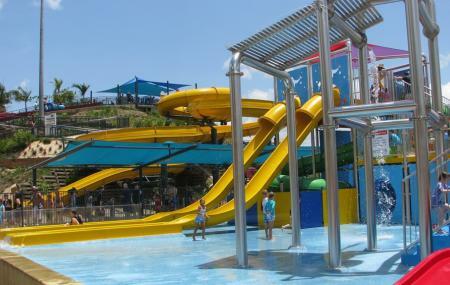 Different types of water rides and slides are there where you can enjoy at least an hour or two with your kids. The management team of the park takes all the responsibility of providing safety to the infants, kids and adults to make their visit safe and enjoyable. To know more about ticket price, visit their official website. Children under 3 years of age must wear tight fitting pants or waterproof nappies all the time while using the pool. Kids Interactive Play System (KIPS) Area is reserved for children of 10 years and under. To know more of the details on rules and regulations, visit their official website. Children under 12 years of age are not allowed into Water Park complex unsupervised. How popular is Sugar World Water Park? People normally club together Paronella Park and Cairns Hot Air Ballooning while planning their visit to Sugar World Water Park. Amazing place to spend a day or half day. Waterslides are fun specially with kids between 6 years and older. Almost all slides are safe and you do not need to worry about. Please don't expect too much as it is not a waterpark like Gold Coast. Very economical as you just need to spend 61$ for a family of four including big slides. Also greenery and park is very good. My kids loved it and me and my wife too. Being local we usually love Sugarworld but today we turned up on a beautiful sunny day after weeks of rain to the main part of the park not working. When I asked if there was a discount because of this the answer was NO. Very disappointed. Also the cement needs marine carpet or something because it's so hot on the feet. Excellent for children to play with water. Two level of entry fee. If your kids are 8 or below, don't buy the higher price. They won't be able to make it. We love going to SugarWorld as there is an incredible range of tropical fruit trees planted there. They are all well marked with little signs to tell you what tree they are, and it’s very interesting to wander about the park identifying the fruit. There is always something there fruiting. On our most recent trip all the mangosteens were fruiting and I was surprised to see just how many varieties there are. Worth a visit. The park itself is not bad. The cafe is a joke. The staff have no idea and appear to lack training. 40+ minutes for $10 (over priced much?!) wedges despite polite questions/reminders to multiple staff members. No receipt provided. No apology. No smile. Might help if management actually trained staff in customer relations and time management or revisited these principles.